An old man, resting in one of the Qarawiyyin Mosque doors. The Merinids did not build Fes, but they made it their capital. The Merinids created one of the dynasties that a contemporary, Ibn Khaldun, was surely writing about in his Muquddimah. As the Almohads lost the confidence of their supporters and allies, the Merinids waited in the wings with fresh energy. By the end of the Almohad dynasty, Al Andalous had been reduced to the Nasirid kingdom of Granada. The Merinids took in the refugees from Spain, but confined their interests mostly to Africa. They made Fes their capital, but left their mark across North Africa. The Almohads (and the dynasty before them, the Almoravids) were Berbers who came out of the Atlas, full of religious fervor and zeal, to establish themselves as rulers of Morocco and cross the straits to intervene in Spain. The birthplace of the Almohads, whose name derives from the oneness of God, is near Tinmel on the road to Tizi n Test in the High Atlas. Today Tinmel is nothing but a village, but it boasts the ruins of a beautiful mosque from Almohad times. 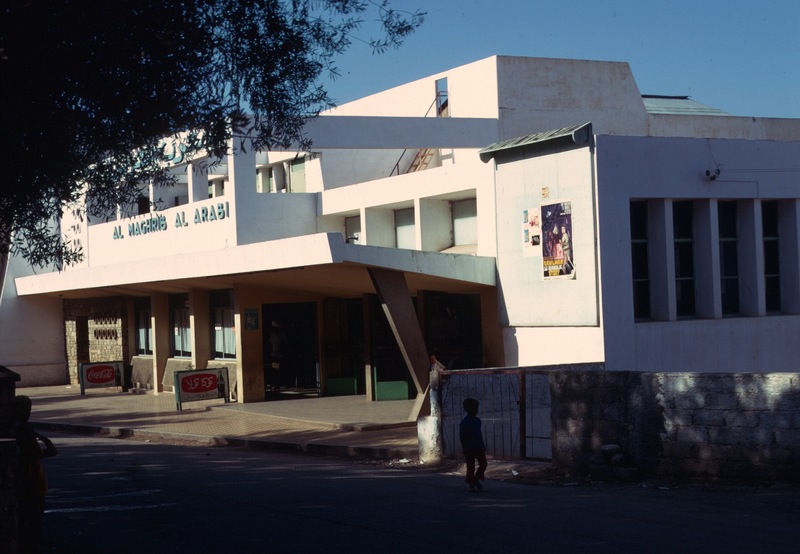 The Almohads left an indelible architectural imprint on Morocco. They built the Koutoubia Mosque in Marrakech, famous for its minaret, as well as two other massive minarets, modeled after it: the unfinished Tour Hassan in Rabat, and the Giralda Tower in Sevilla, Spain. All are noted for their proportions and fine decoration as well as their size: each is large enough inside for a ramp that would allow a horse to be ridden to the top. The Giralda, in my opinion, was not improved by the Renaissance bell tower, added to grace the cathedral that replaced the grand mosque. The Tour Hassan was never finished, nor was the mosque it was supposed to serve, and the latter was further damaged in the great Lisbon earthquake of 1755. Nearly 50 meters high, the Tour Hassan was for many years one of the highest structures in Rabat. When I first visited it in 1968, there were no barriers on the top, and one could sit, if one dared, with feet dangling over the edge. No fence, just a 50 meter drop. But what a view! Sale is across the river in the background. The minaret far in the distance is from the Almohads’ predecessors, the Almoravids. Unfortunately a rash of accidents and suicides led to erection of an ugly chain link fence on the top of the minaret. What remains of the mosque is simply marble slabs and ruined pillars. On the south end of the site is a newly constructed tomb for Mohammed V, a beloved ruler of the current dynasty, who led Morocco to independence. I wonder if he might have preferred a simpler tomb. The Tour Hassan has stunning views of the Casbah of the Ouidayas, the Bou Regreg River, and the city of Sale. A fortified enclosure, built by the Almohads, the Casbah of the Ouidayas dominates the river as it enters the Atlantic. The Almohad gateway to the Ouidayas. Its massive entryway is another classic example of Almohad architecture. In March of 1973, I became severely ill in Sefrou, and ended up recuperating in the house of friends who lived in the Ouidayas and spent several weeks there. The Ouidayas has a small medina, and it had great south-facing views that attracted foreign residents. There is also a museum and walled gardens below the residential area. On the Atlantic side of the Ouidayas is a large cemetery by the ocean. Paths run down to the jetties that protect the Bou Regreg. People fish from them, and if you walk out to the end of one, you will be rewarded with terrific views of the Atlantic Ocean swells. South of the Ouidayas, the Almohads created a necropolis with royal tombs, known today as the Chellah, on the slopes of the Bou Regreg’s valley. The site they chose was a Phoenician trading post, and later Roman site, Sala Colonia. It had already been mostly abandoned when its Byzantine governor, Count Julian of Ceuta, surrendered to the Arab general, Oqba Ben Nafi in 683. The latter is supposed to have ridden his horse into the Atlantic, calling for God to witness that he had brought Islam to the end of the world. True or not, it is a romantic image as well as one speaking to the pride of Moroccan Muslims. Today the Chellah is surrounded by the modern city of Rabat. A wall, built by the Merinids, encloses the ruins of the various civilizations that occupied the site, and the Merinids further endowed the Chellah with a mosque and tombs, now also in ruins. The Chellah is an interesting place to explore. When I was there, there was a pool with eels. Women would come to it and feed them, possibly hoping for success in getting pregnant. Cats often surrounded the pool, begging for food. …and the cats hope to get what the eels don’t. Rabat was also the home of Barbary Pirates who are often associated with Sale, Rabat’s sister city across the mouth of the Bou Regreg. Sale was founded by the Almoravids. I lived there for a while in 1973 with a Peace Corps volunteer and a Moroccan friend, Ali, who was attending the University in Rabat. Most people cross the bridge between the cities, but there is an ancient ferry service that perseveres and can save time depending where you live in Sale. As I write, the wind is howling. The weather forecast for the night is three to six inches of snow and a wind chill of -15 to -30F° (roughly -20 to -30° C). There is shore ice on Lake Ontario and Lake Erie is rapidly freezing over. Temperature is -20° C.
Sitting indoors, the weather outside invites us to reflect on sunnier climes, both here and abroad. I have been thinking about Jbel Toubkal. As it is the highest mountain in North Africa, and, one of the most easily accessible high mountains on the entire continent, hikers and climbers flock to Jbel Toubkal. A short bus or taxi ride takes one to Imlil, a large village in the valley below the mountain. Since I first visited Toubkal about 50 years ago, a serious tourism industry has grown up in this area. In my time, other than a stone dormitory building that the Club Alpin Français (CAF) left, there was just a village there, with villagers willing to sell you food, and muleteers offering their services to take you to the CAF huts of Neltner, De Lépiney, and Tachdirt. Today I see that a second hut exists next to the renamed Neltner, that businesses have grown up around Sidi Chamharouch, and that Imlil itself has holiday lets and lodging for tourists. Bemoaning commercialization would be mean and selfish. There is no begrudging the living that the locals can make off of tourism. Life in the mountains is always difficult, and tourism is a great addition to the local economy. There is no pretending that Toubkal is remote. In the seventies, a motorcycle group surprised us at Neltner, getting all the way up to the hut with their large bikes. On the other hand, the hut was never crowded in those days, and, once out of the hut, one hardly saw other hikers or climbers in the mountains. My first visit to Neltner was in the summer of 1969, with other Peace Corps friends. Mules took our baggage up, while we walked, a good way to acclimatize. We climbed the mountain by the gulley opposite the hut, an easy walk via a steep scree slope. John Paulas and I had fun taking giant, gliding steps in the scree, and made it down from the summit in no time. This is the standard walk up route, and not much of a problem for a reasonably fit person in dry weather. There are good views from the summit. Summit view of Jbel Siroua, a 10,000 foot extinct volcano, in Saharan Atlas. Want an interesting hike? Do Siroua! 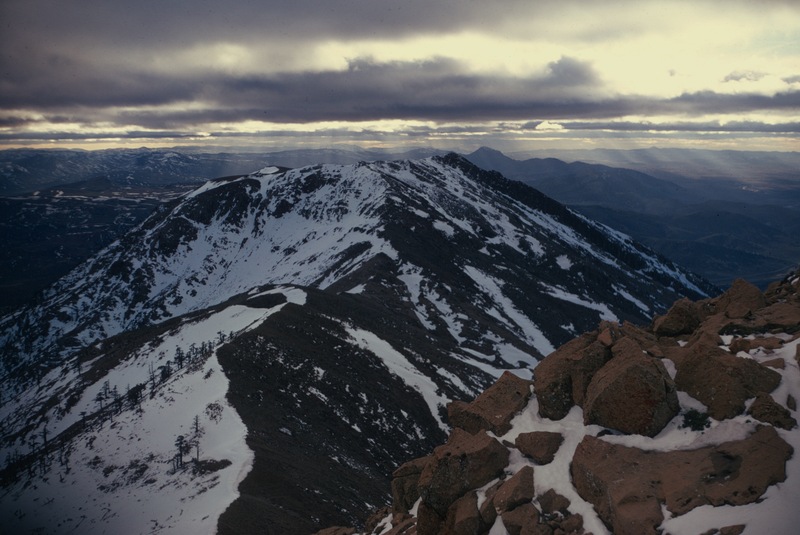 The real dangers on Toubkal are snow, ice, and bad weather. In 1970 an ill-prepared group of embassy people had a bad accident, with a member of the Turkish embassy slipping and sliding a long way down the standard route, and suffering serious injuries. Skiers can face avalanches in the winter, too. Tizi n Ouanoums, and profile of west ridge route, from Timesguida or Ras n Ouanoukrim. Jbel Siroua in far distance. The three towers on the ridge are clearly visible. 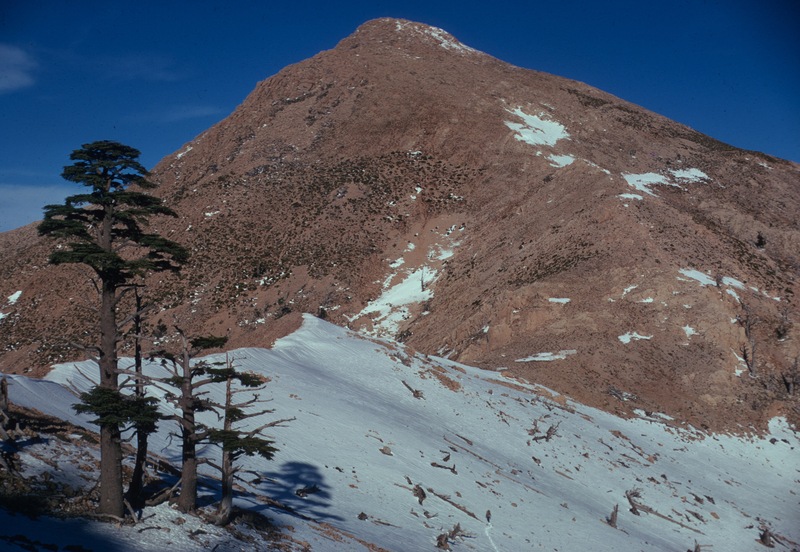 The classic climbing route is up the west ridge, which starts at Tizi Ouanoums. I found it easy, and did it once alone, and, another time, with an Englishman whom I met at Neltner. Climbing the second tower on the west ridge of Toubkal. I do remember meeting a couple of young French climbers in Imlil on one of my visits, who complained in disappointment that the rock was rotten and that the route was not very challenging. I can understand that. The climbing is straightforward, not very exposed, and the rock could be better. With my limited skills, however, I found it enjoyable, and it is more scenic than the gulley route. Neltner, at 3,200 meters, also served as a base for other trips: Tadat, Akioud, and hikes to the Lac d’Ifni. Tadat is a rock spur or isolated tower on Tizi n Tadat. Akioud is a ridge between Ouanoukrim and Afella that offers an easy traverse. The Lac d’Ifni is a tarn lake in the Massif of Toubkal, and is said to contain native trout. One simply follows the main valley above the hut over Tizi n Ouanoums, and down to the lake. Of course, if you don’t know where you are going you may have problems. I once stood on Tizi Ouanoums shouting at the top of my lungs to my friends Maya and Dan, who wanted to go to the Lac d’Ifni, but were heading toward Tizi n Ouagane! At least a thousand feet above them, they simply could not hear me, and there were no others on the route to set them straight. They only discovered their mistake when they found no lake at the bottom of the valley! Still they had a great time. I ended up summiting most of the highest peaks around Neltner, all of which are easy walk ups. If you are thinking about doing it, go when there is snow on the mountains. They are parched and bleak in the summer. Tadat. Cover of a special edition of the CAF Casablanca review, La Montagne Morocaine. I probably found this in the suq in Rabat. What a great piece of history. I always wanted to climb Tadat, but never managed to do it, though my friend Jean-Michel Vrinat, and some other French friends with whom I climbed did it. Jean-Michel was a coopérant, who arrived in Morocco with a carload of sporting equipment (fencing foils, shotgun, etc.) which included climbing gear. I did lead this group, with friends Gilles and Sylvie Narbonne on a traverse of Akioud, which I had done by myself before, and I think that they really enjoyed it. Gilles and Sylvie Narbonne, au sommet d’Akioud. 1977. Toubkal à l’arrière plan. Akioud is an easy walk from the Neltner Hut, and, done from south to north, requires no rappelling. A rope for belaying and security is useful, but not needed for good climbers. Finally, a trail leads to the third CAF Hut, Tachdirt, near the village and below the pass of the same name. I visited Tachdirt twice. In the spring, there was too much snow, and I think that we spent a couple of cold days in the hut before going back down. Tachdirt after snowfall. Villagers clear snow from roofs. A second time, we thought we could walk the ridges between Tizi n Tachdirt and connect to the trail to Neltner. We totally underestimated our physical condition and the difficulty involved. Having climbed from the pass to the ridge of Jbel Anrhemer, we camped out just below the ridge. I awoke sick the next morning. Climbing along the ridge, I became increasingly dehydrated, and needed water, which necessitated descending to the nearest snow patch (of which there were precious few—this was summer.) We ended up returning to Imlil, then walking the trail to Neltner, arriving in the middle of the night, in my case with the assistance of a mule for the last kilometer. What a day! La montagne n’a pas voulu! This article is about Christmas, of course, not the Prophet’s birthday, the Mouloud, which Moroccans, and most Muslims celebrate. This year the Mouloud fell in December, within a month of Christmas, which my wife and I just spent in Charlotte, North Carolina, with her brother and his wife. While there I reflected on the holidays that I spent abroad, though there have not been very many. Of them, the Christmases and Thanksgivings come to mind first, most likely because they involve iconic symbols, and childhood memories. Christmases also fall within a week of New Year’s Day, and often make up part of a larger period involving school semester breaks and intermissions, important in the lives of young people and probably producing more intense and lasting memories. In Morocco, volunteers would often travel at Christmastime. The Moroccan calendar had all kinds of holidays, and accommodated as well as it could both Christians and Jews. Many foreigners still worked in the GOM in the sixties. If PCVs had vacation time, it enabled them to visit remoter parts of Morocco, or to go to Spain. When my cousin, who was studying in Angers, France, visited me in 1968 or 1969, I traveled with her and Gaylord Barr to Meknes, Rabat, Marrakech, and over the Atlas and across the pre-Sahara to Ouarzazate and Boulemane and Erfoud. Another time, I went to Gibraltar with administrator and volunteer friends. Ceuta was still another possibility for those of us in northern and eastern Morocco. Just as often, volunteers would get together in larger centers and big cities, where they were often numerous, and have parties. Those traveling would look up friends for places to stay and for good cheer. By the time I got to Morocco, there were fewer and fewer churches, and I do not recollect any volunteers going to them to pray. Actually the celebration of Christmas and Thanksgiving usually had little religious significance to the volunteers whom I knew. Christmas had attained an almost secular status in the United States, and was, and is today, dominated by commercial rather than religious sentiments. Recently some right-wing Republican politicians have argued that there has been a “war against Christmas” by more secular politicians in the center. They point out attempts at what they see as “political correctness” as well as a more consistent effort to keep religion and the state separated, as the Constitution requires, though they do not see it exactly that way. There is a real argument here over all kinds of issues, and if you are very religious you may be offended. My own opinion is that though most Americans are nominally Christians, government institutions should be secular. Am I making war on Christmas? I say Merry Christmas where appropriate, attend religious services, give gifts, and assiduously attend to the customs associated with Christmas. Do I care if there is a crèche in front of City Hall? Not much. And it certainly should not be there if it offends my compatriots. Christmas is not the central focus of Christianity. Indeed, many early American religious denominations, such as the Puritans, did not hold Christmas sacred, did not celebrate it, because they considered it a pagan holiday. After all, it aligns with the winter solstice, which was widely celebrated in pagan religions of the ancient world, and it isn’t clear exactly when Jesus was born anyway. The real essence of Christianity, all true Christians would agree, is in the death of Jesus and his resurrection as the Christ, and the redemption of the sins of mankind by his death on the cross. Indeed, these very beliefs set off Christianity from Judaism and Islam. Though most Jews believe Jesus existed, and all Muslims revere him as a prophet the message of Judaism and Islam is elsewhere. Christmas retains its religious significance for many, but in the United States today, as in the United States 50 years ago, Christmas is largely a children’s holiday involving family get-togethers, food, and, above all, gifts. I came from an Italian family, and my Aunt Mary and Uncle Bill would follow a Sicilian custom, though their ancestors did not come from Sicily, and serve guests a Christmas Eve dinner where seven different kinds of fish were offered. Those who were observan often fasted until after they attended Midnight Mass. Then one could eat and open presents, while relatives and friends talked and drank and often played cards. The social aspects of religious holidays are so important, not just to Christians, but to Muslims and Jews as well as adherents of other faiths. I remember with fondness the kindness of Muslim friends and neighbors, who invited me to their homes for all the major feasts. Indeed, I think I looked forward to Muslim holidays as much as my Moroccan friends! As a volunteer in the sixties, celebration of Thanksgiving and Christmas was dependent on mood and who was around or would be visiting. The first Christmas, having moved into the house in Seti Messaouda, Gaylord and I actually dragged a 12-foot cedar up the winding stairway and into the courtyard (where it touched the ceiling), and decorated it with homemade ornaments and garlands. The popcorn strung together in garlands eventually got stale and the hanging tangerines mildewed, and our Moroccan friends probably thought we were nuts or idolators. Only the cat really enjoyed the tree, climbing in the branches, and, there were no more trees after that.There were no religious celebrations, and I don’t remember exchanging gifts, either. There was also a Thanksgiving or two when we cooked a turkey. One took place in 1970, when a couple of female volunteers, Ruth and Jan, were then teaching English in Sefrou. They lived next door in the house of the Hadja, a widow, so there was, with Jan’s boyfriend, a critical mass of Americans. Seti Messaouda for a while had a small American quarter within it, just within the gate. We invited friends, Moroccan and volunteers, and tried our best to put together a traditional Thanksgiving meal. Two ingredients were difficult or impossible to come by: cranberries were nonexistent and the turkey posed a problem. With more foresight we could have probably got the cranberries through someone we knew with PX privileges at the base in Kenitra. Turkeys were a different matter. Turkeys were not common in Morocco. They are not part of traditional cuisine. They are harder to raise than chickens and less hardy. Where I lived, they were known as bibi, though in the former Spanish zone they were often called by the Spanish name, el pavo (from the tail, perhaps, as a peacock is el pavo real.) Turkeys have various names in the languages of the world. A late import from America, part of the Colombian exchange, the English named the birds after the country of Turkey. They were exotic beasts that merited an exotic name. In France, India was apparently more exotic as the birds were said to came from India. D’Inde became dinde eventually. Whatever turkeys were called, they were not common. In Sefrou we were able to get one relatively easily, maybe from Fes, but, later, living in Chauen, I had to scour the countryside, driving to Ouazzane to find one. Roasting the turkey also proved difficult. We had no oven, and, even if we had had one, it probably couldn’t have contained a large turkey. We decided to cook our turkey in the neighborhood ferran, the communal oven, where Khadija baked our bread daily. We always has a Muslim man kill animals for us so the meat was halal. The recipe called for basting it every twenty minutes with butter. After a couple of hours, the baker, the mul el ferran, said safi, enough is enough. The ferran was busy and it wasn’t helping his business to keep opening the oven and taking the turkey out. Luckily, with the hot temperature of the bread oven, the turkey was properly done, crispy and cooked through. And so we ate turkey with stuffing, mashed potatoes and gravy, green beans, and other dishes, and celebrated our American holiday with Moroccan friends. And what was left over, and there was a lot of it, went to the poor outside the main mosque, where excess food often went if Khadija didn’t take it all home. Living in the eastern Middle Atlas, the High Atlas beckoned from afar. Marrakech required a long bus ride through Kenitra and Beni Mellal or a trip to Rabat and then south to Marrakech. I never got to the Toubkal Massif as much as I wanted, and envied volunteers who lived closer. I did climb many of the peaks there, accompanied by friends, and even family. 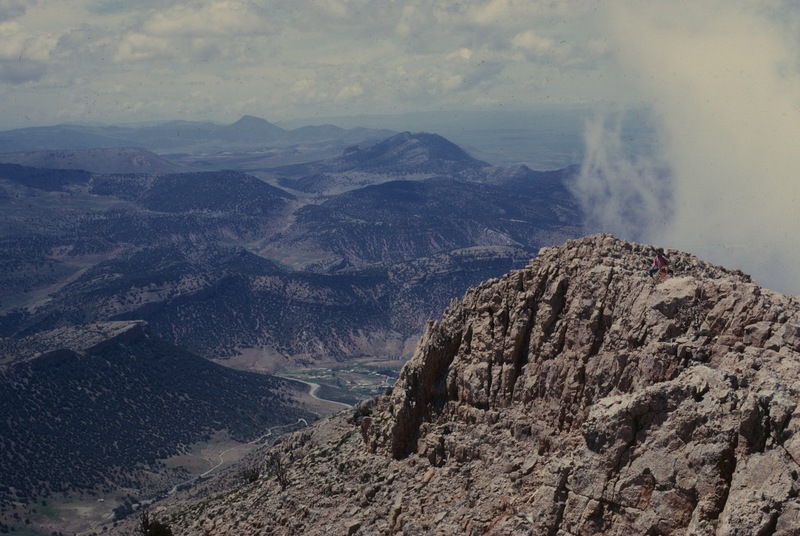 Perhaps as I digitize more of my old Kodachrome slides, I will get into specifics, but this post is a compendium of a number of trips and a tribute to a spot of the world that was important to me, the mountain named Tazaghart. Today the High Atlas mountains are served well by climbing and hiking guides, but the main sources in my day were the Club Alpin Français’s long out-of-print guide to the Toubkal Massif, the curious guide book, Villes et Montagnes (a guide to cities and mountains, but nothing else), and topo maps. Today there are any number of tourist organizations that will take you on long walks and climbs. And there are good English language guides to the High Atlas by Hamish Brown and Des Clark. In my day, the heritage of the French Protectorate was a number of huts and a larger dormitory at Oukaïmeden, primarily for skiers. That may not have changed much, but I suspect all are used more intensively today. The route up to Toubkal is much more developed. I have also noticed more young Moroccans climbing Toubkal, and it is nice to see they take that much interest in the natural beauty of their own country. Nature is always under pressure in the Mediterranean world. Morocco has more than twice as many people today as it had when I lived there 50 years ago. One of the great charms of the place was that the mountains were empty. One seldom saw another human in the high mountains, and, except at Neltner, below Toubkal, the huts were generally empty. I was there at a time when few Moroccans climbed mountains and the French were still leaving Morocco. Rather than try to assemble all my memories into a single post, I am limiting this one to Tazaghart, in the Toubkal Massif. Future posts will cover Toubkal, Angour, and some day excursions around Toubkal. As I find more of my old slides, I may add to this collection. I realize that they are of uneven quality, but in my day film was expensive and Kodachrome was beautiful, but slow. Exposure was often a problem. I do envy modern photographers who can shoot without running out of film. When I re-upped, I went home to the States by way of Paris, where I spent a few days. I went to Chartres to visit its Cathedral, I discovered that I could speak Arabic to Parisian waiters, mostly Algerians, who were delighted to hear their dialect from an American, and I missed an opportunity to hear Georges Brassens perform, for which I will ever experience a sense of loss. But, in the cold and drizzle, I discovered Au Vieux Campeur, an outlet for camping, climbing, and other outdoors pursuits, on the Left Bank, not far from the Sorbonne. I invested in an ice axe, ropes, down clothes, and other paraphernalia which I thought I would need to climb more mountains. The memories of crossing the Pyrenees were fresh in my mind, and I wasn’t going anywhere unprepared again. The items that I bought got their first use on Tazaghart, my favorite place in the Toubkal Massif, and, later, more extensively in the French and Swiss Alps. Louden Kiracofe and I had climbed Toubkal by the standard walk-up route in the summer of 1969, as part of a large group of volunteers. Now we would go to Tazaghart, and climb it via the Couloir de Neige, a steep gully filled with snow. We knew it had a bit of real climbing, and some steep snow, but we were up to it. Or so we thought. A loose translation might be: “The summit is a rocky desert, flat, bare, empty, perched so high there is nothing but sky.” The name tazaghart is Berber and means “little plain or plateau.” What is remarkable is how high it is: over 13,000 feet. Most of the mountains in the area are lower than this. No others have a summit big enough for a football game! 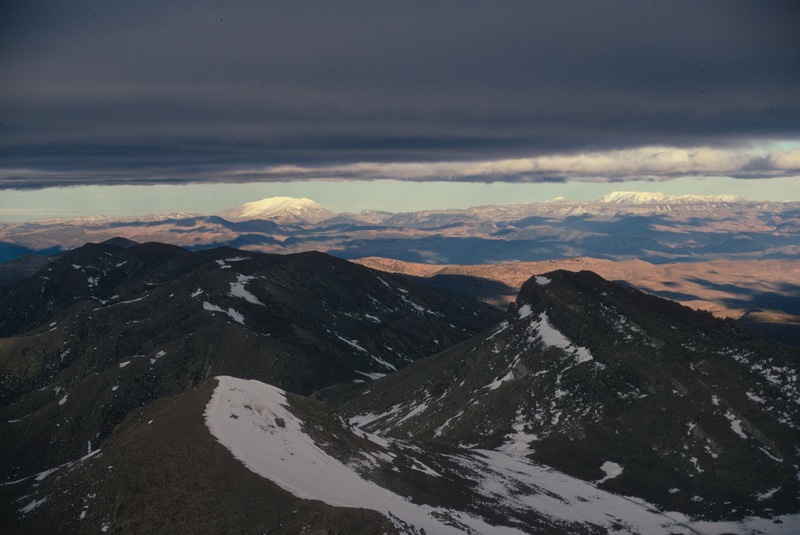 Un désert de pierres: the summit plateau of Tazaghart. Louden. One has a good view of the Tazaghart from Oukaïmeden and Jbel Angour. At Oukaïmeden, the French put up a tableau d’orientation, which identifies most of the mountains in the massif. I have a better picture of it that shows Tazaghart, but I haven’t found it yet. You find these tableaus, usually installed by the Touring Club of France, now defunct, all over France and in many parts of its former empire. There is one in Fes, for example, that points to Sefrou and Bouiblane, among other places. 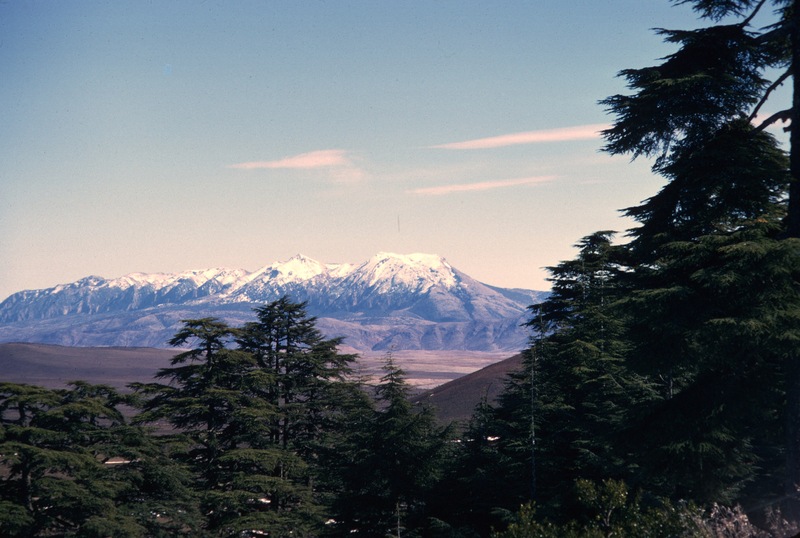 Though you can see Tazaghart from Oukaïmeden, the most spectacular views of the mountain are from the valley below it and from Jbel Ouanoukrim. We traveled with Louden’s wife, Ginny, and an old school chum of hers, and stayed at Le Sanglier qui fume, a restaurant-hostellerie run by an elderly Frenchman, at the beginning of the road up Tizi n Test. Louden and Ginny had stayed there before, after an exhausting winter drive over Tizi n Test, and had been charmed by the warm welcome, decent food, and the fire burning in their room. The owner was Paul Thenevin. Today the hotel is still there, but managed by his son. There was a boar’s head in the dining room, with a pipe in its mouth that puffed smoke. It was June, I think, when I first went there. 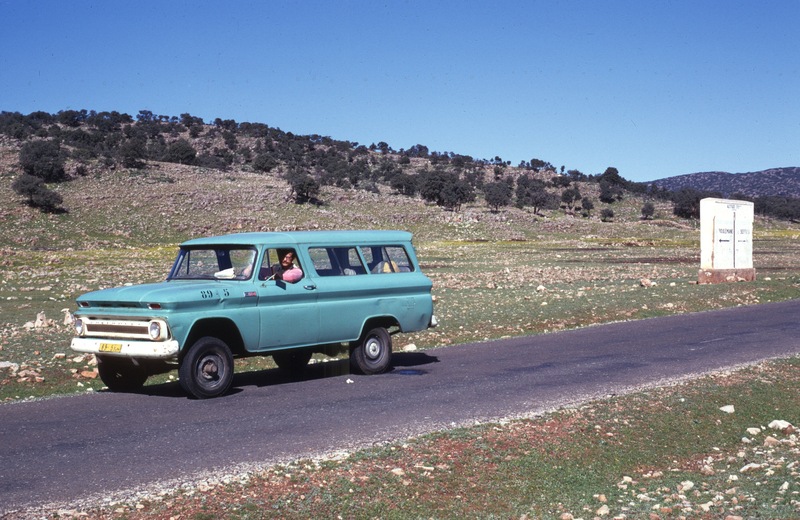 The weather was fine, and we drove to Imlil in Louden’s VW station wagon, and found some porters to take us to the de Lépiney refuge owned by the Casablanca section of the Club Alpin Français. As it happened, they only took us to an aluminum shelter much lower in the valley. I think the spot was Azib Mzik. The place was basic, hot, and stuffy. The women must have stayed there, as Louden and I hiked up to the de Lépiney Refuge, which sits in a beautiful spot that offers views down the valley, and across it to the face of Tazaghart. We wanted to see Tazaghart. The walk up the valley was beautiful. I think that we came back again to do the Couloir de Neige, I can’t say. It’s hard to imagine leaving the women by themselves below. So it was probably yet another trip. De Lépiney was an early French climber, and instrumental in making climbing a sport for all. He spent much of his life in Morocco, and, sadly, died there in a freak accident at Oued Yquem, a spot where climbers from Rabat still rock climb. From the azib, the foot of Tazaghart is reached by proceeding directly up valley on a good mule trail. It follows a small stream through some ancient junipers, past a small falls, and eventually emerges above the tree line, in sight of the de Lépiney hut. The de Lépiney Hut was comfortable. It was not heated, which was no problem in the summer. We left the windows open. Situated at about 10,000 feet, it was cold during the other seasons, but certainly preferable to camping in the snow. In any case, late that day, we climbed out of the valley, up behind the refuge, for a good view of the Tazaghart face and the Clochetons de Ouanoukrim. Most of the Couloir de Neige can be seen. The only serious obstacle is a chimney, which, when the snow is melting, can become a shower. It was late, and Louden had stumbled and cut himself on a sharp rock so we descended. Early the next day we entered the Couloir de Neige. Louden in the couloir. The snow was icy and we needed to make steps. Once we entered it, we found that the snow turned to ice, and our crampons hardly gripped it. Louden had an ice screw, but neither of us had experience cutting steps, so we gave up. I really think it might have been too soon. I think we could have negotiated the chimney, and, once above it where the snow would have been softened by the sun, we could have continued. We had ropes so setting up belays was not a problem. I wish now that we had tried that, but I always remember St. Loup’s La montagne n’a pas voulu. Better to be safe and sound. You cannot count on being lucky. We left the couloir, and continued up the main valley to Tizi Melloul. Five years later, I was back in Sefrou studying, and Gaylord Barr, my former Peace Corps housemate, showed up for a visit. He brought me a new pair of Reichle boots which I had ordered from R.E.I., and we went down to Marrakech to climb Tazaghart. It was July or August. Marrakech was hot. In the USA, John Dean had just given testimony to the Senate Watergate committee, and President Nixon’s days were numbered. We stayed overnight, picking up some supplies, and took a bus to Asni, I think, from which we got a taxi to Imlil. Gaylord had been to Marrakech several times, and crossed Tizi n Tichka on the way south, but he had never hiked in the Toubkal Area. We hired a mule for the baggage, and left Imlil in the middle of a moonlit night, passing through sleeping villages on the way to Tizi Mzik. The only noise was the clipclop of hooves and an occasional watchdog bark. The full moon provided great views of the valleys and peaks. We reached Tizi Mzik by dawn. We had good weather. In the summer, bad weather is rare. Just don’t count on finding water along the mountain crests. We stayed a couple of days. The view from the De Lépiney Hut is grand, with a waterfall, an expansive view of the face, as well as pretty views down the valley. I think one can also see the lights of Marrakech far off on the plains below. Everyone wants to climb Toubkal, but Tazaghart is much more scenic. If one has the time, it isn’t difficult to visit both areas in the same trip, and be rewarded with great scenery. The easiest route up Tazaghart is up one of the several gullies that furrow the face. We chose one on the right, either Tsoukine or the one to its left. Or maybe the Diagonal. It’s a bit hazy now. It was easy enough for a local dog, which we had been feeding, to follow us up to the summit, though the dog had to be resourceful to get around a few steep bits. Maybe we did do the Diagonal. At the summit there were clouds rolling in, and thunder in the distance, so after a brief rest, we descended by way of Tizi Melloul fearing rain and lightning. We got a bit of rain, but no lightning. 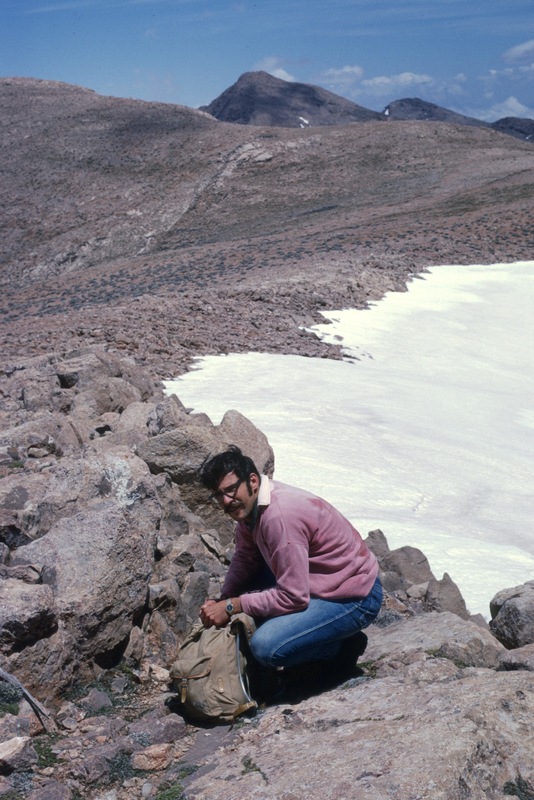 The next time, and last time, I visited Tazaghart was in the late spring or early fall of 1977. The weather was cold and wet, and I don’t remember climbing anything, but I did witness a spectacular landslide that involved some house-size boulders rolling down one of the couloirs, a good reminder that even easy routes may have unsuspected dangers. The block visible in the lower left of the photo was far bigger than a house! That is rock and dust in the Couloir and trailing the immense block, and not a cloud! On that trip we captured a dormouse and took it back to Chauen. When I left Morocco in 1978, a Peace Corps couple in Tetuan took the creature and continued keeping it as a pet. It was cute, but dormice are most active at night. We rarely saw it, but we always heard it scurrying in its enclosure after sunset. It was part of a menagerie of cats and tortoises.